White Mountain Regional Medical Center's clinical pharmacy is equipped to meet the medication needs of the hospital's patients 24 hours a day, seven days a week. 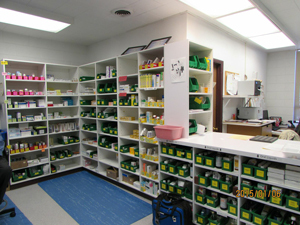 The pharmacy is responsible for acquiring, storing, controlling and distributing medications. To ensure patient safety, the pharmacy staff also reviews physician orders and check the patient's profile to monitor for possible drug interactions. Four out of 10 older people who take more than one drug still do not take one or more of their prescriptions according to their doctor's instructions. Can I take this medication while pregnant, planning to become pregnant, or while breastfeeding? Does the medication interact with any foods, alcohol, other medications (including over-the-counter medications and/or dietary supplements), or activities? Do I need to be concerned about taking this drug prior to surgery or medical/dental procedure? Do I need to inform my doctor if I am sick and unable to take my medication? Use your medication for any symptom of illness other than the one for which it was prescribed. Take someone else's medication or give your medication to someone else. Take more or less of a medication, unless directed by your health care professional. The following steps are designed to make it easier for you to organize your medications and related information. List all medications that you take, which include prescriptions, over-the- counter drugs, vitamins, and supplements. Jot down questions you want to ask your health care professional. Write down your medical information. This includes emergency contact, primary physician, and allergies. Keep it in your wallet along with your insurance information.